*literally translates to "red ribboned kelp"
Frilly red ribbon is a leafy red algae. It branches dichotomously many times, reaches 10-15 cm tall, and is a shiny deep red to yellowish-pink colour. Its narrow, flattened blades taper towards a discoidal holdfast. Frilly red ribbon can be found on rocks in the high or mid intertidal in semi-exposed areas. 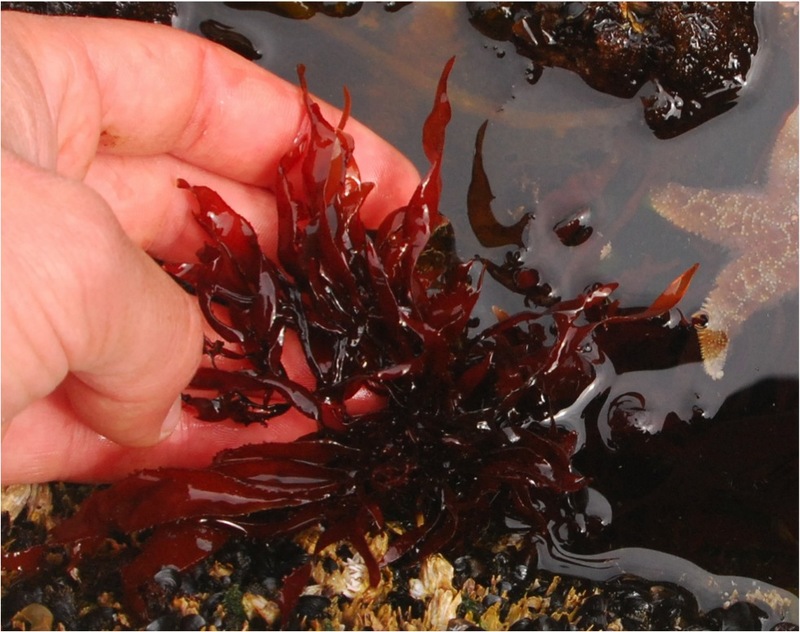 It often grows alongside ribbon kelp (Alaria marginata). Its range extends from the Aleutian Islands in Alaska to northern British Columbia. It its also found along coastlines in Russia. There are several species of Palmaria that occur in similar habitats. It is generally the highest-growing species, and is also the species with the narrowest and smallest blades and the most branching. Red ribbon (P. mollis) and red sea fan species (Callophyllis sp.) have wider blades and less branching - giving them a distinctly less 'frilly' look than frilly red ribbon. Red sea fans are found in subtidal and rarely low intertidal areas. Lindberg, M. and Lindstrom, S. (2010). Palmaria callophylloides. Seaweeds of Alaska. Accessed 30/07/2014. O'Clair, R. and Lindstrom, S. Palmaria callophylloides Hawkes et Scagel 1986a. In Klinkenberg, Brian. (Ed.). E-Flora BC: Electronic Atlas of the Plants of British Columbia. Lab for Advanced Spatial Analysis, Department of Geography, University of British Columbia, Vancouver. Accessed 30/07/2014.